What’s the deal with Glastonbury? 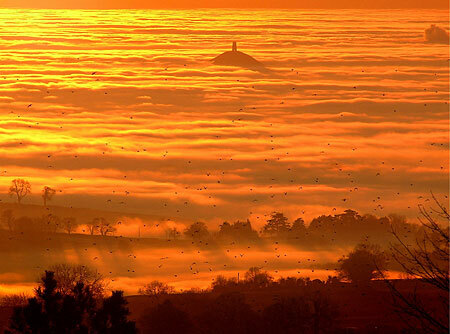 Glastonbury Tor; or the island of Avalon emerging from a sea of mist? Glastonbury in Somerset is known as a pilgrimage site for neopagans and adherents of various “alternative spiritualities” world wide. The mythology of the place is full of stories about Arthurian knights, primeval British Christians, druids, the lost tribes of Israel, healing wells, and the Holy Grail. Theories about secret connections between ancient monuments, and hidden correspondences or “lay lines” connecting features in the landscape of Glastonbury are easy to find. What is the history of all this local myth? How did this small village become such a major centre of heterodox pilgrimage? What does the phenomenon of Glastonbury tell us about religion generally, and its British history specifically? These are among the questions that Hereward Tilton explores in an ongoing research project. He spoke about it at the Contemporary Esotericism conference in Stockholm this August, and the paper has now been made available online at the ContERN website. It is interesting work, even if it is no doubt going to be controversial in certain circles. But there is already a lot of related research in the cognitive study of religion that might serve as a basis for further research along these lines. It was, for example, only a month ago that the journal Applied Cognitive Psychology published a study that found “religious” and “believers in the paranormal” to be more prone to apophenia (illusory face perception in this case) than “sceptics” and “non-believers”. Tom Rees recently blogged about this research at Epiphenom (which, by the way, is an excellent resource for staying up to date on research that explores the relations between psychological, sociological and cultural factors in accounting for the disparate phenomena we call “religion”). Studies exploring the relation of conspiracy belief and schizotypy are also not hard to come by (see e.g. this recent paper from Personality and Individual Differences). One should not exclude the possibility that research along similar lines might have a role to play in future theorising about esotericism as well. I for one certainly look forward to see what Tilton will do with these connections in the future. This blog post by Egil Asprem was first published on Heterodoxology. It is licensed under a Creative Commons Attribution-ShareAlike 3.0 Unported License.